PEMF induces tiny microcurrents into tissues, and a form of biofeedback known as the vascular autonomic signal (VAS). These microcurrents are detected with the radial arterial pulse, and are used to select the best frequencies and anatomical locations for stimulation. ONDAMED® is unique because it adjusts treatments to the individual patient. Moreover, the currents are well below the levels that can be felt by our nerves. Hence, the patient rarely senses the stimulation, except for the faint sounds emitted. These sounds provide biofeedback to the patient and therapist. ​The process begins with placing a magnetic applicator around the patient’s neck to introduce frequencies into their body. The operator then scans through a range of PEMF frequencies from 0.5 to 32,000 Hz by turning the wheel on the regulator.When a physiologically significant frequency is induced into the body via the applicator, there is a subtle but palpable change in the radial artery pulse. When a response is detected, the operator depresses a button on the regulator, and the ONDAMED® stores the frequency in its memory. When the full range of frequencies has been scanned, the ONDAMED® is shifted to a treatment mode. The operator then scans the body with a hand-held applicator that emits the same frequencies to which the body responded. The appropriate anatomical position of the applicator and the optimal distance from the body are determined, again guided by the radial artery pulse. Various other applicators are available to treat large areas such as the spine or the abdomen. A second mode of operation involves using the radial artery pulse to select between 173 preset programs with bundled frequency patterns, preset time, and intensity. PEMF was originally developed and tested for the treatment of bone fracture non-unions and delayed union, both of which are costly and debilitating conditions. The method has been accepted by the orthopedic community and is widely used. Extensive research revealed the underlying mechanisms, and clinical trials led to FDA approval. It is now understood that sending specific pulses of electromagnetic energy to the outside of the body induces small but measurable microcurrents within the tissues. Faraday’s Law of Induction states that oscillating magnetic fields, such as those produced by a coil, will give rise to oscillating electric currents in nearby conductors, including living tissues. Success with bone healing led to testing PEMFs on other tissues, and it was soon found that each tissue responds to a particular frequency. PEMF signals were identified that could stimulate healing in skin, ligament, tendon, muscle, and nerve. 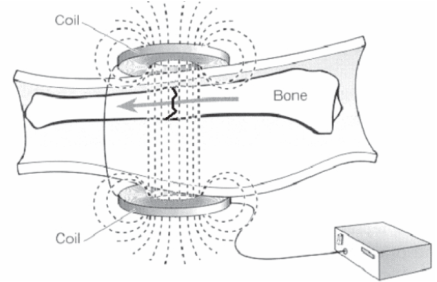 Key to the success of PEMF is the use of very low levels of stimulation, so that the currents flowing through a bone fracture or other injured tissue are on the order of the currents set up naturally within tissues when they are stretched or compressed. The mechanisms by which these microcurrents are produced during normal movements have been documented and involve the piezoelectric effect and streaming potentials. The peer-reviewed literature now contains references to a wide variety of tissues that respond favorably to low level signals of particular frequencies. ​The National Library of Medicine database, Pub Med, lists 234 publications and 13 review articles on PEMF published between 1981 and the present. 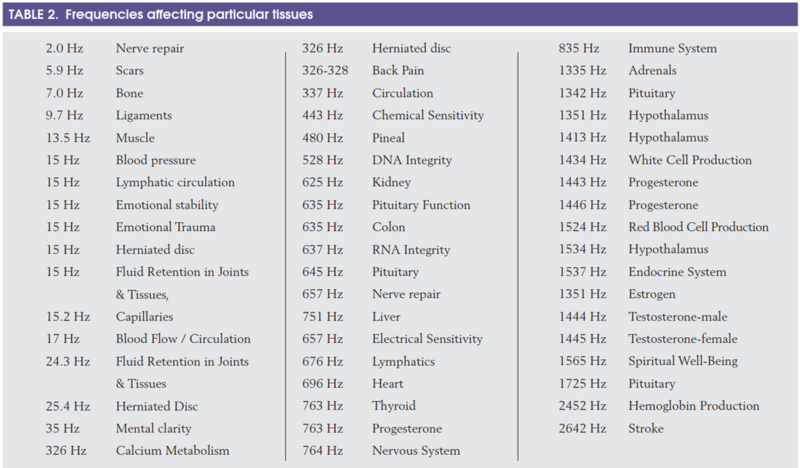 Clinically significant frequencies range from 0.1 Hz to millions of Hz. Some of the tissues and physiological processes affected are shown in Table 1, which is based on peer-reviewed biomedical research. Some of the processes and the corresponding frequencies are shown in Table 2. A variety of PEMF devices have proven safe and effective, and those devices have been given FDA approval and are marketed for treatment of a variety of clinical issues. The reason cells are sensitive to such tiny signals has been determined in great detail. Researchers have defined a cascade of events that take place across the cell surface, through the cytoplasm, and to the nucleus, where transcription is activated. In essence, cells amplify tiny signals. The calcium channel is involved: a single photon of energy can trigger the entry of thousands of calcium into the cell, where they activate particular activities or cellular behaviors.6 As with any clinical procedure, methods employing PEMF are not effective on 100% of the patient population. For example, a series of multi-center clinical trials of PEMF in treating fracture non-unions or dental problems showed that the method was effective in 64% to 97% of cases, depending on measurement protocols. We can ask why all patients did not respond. ​The answer to this question emerged from studies of Peters and colleagues, who showed that the optimal therapeutic frequencies must be determined on an individual basis. This raises another question: how can we determine the optimal frequency for the indvidual patient? Biofeedback using the radial artery pulse, or VAS answers this question. The VAS evolved from the work of a French physician, Dr. Paul Nogier, who taught neurology at the medical school in Lyon, France. Nogier also studied Traditional Oriental Medicine, which includes sophisticated methods of analyzing the radial artery pulse. In 1966, Nogier discovered that the Vascular Autonomic Signal was evoked in the radial pulse (termed the RAC in French, for Réflexe Auriculo-Cardiaque or Autonomic Circulatory Reaction) when he touched certain points on the ear of a patient. Subsequently, he discovered that the arterial system responds in a reproducible manner to a variety of Electromagnetic Field Therapy. To be specific, the VAS is a rapid change in the tone of the smooth muscles in the walls of the arterial system throughout the body, controlled by sympathetic and parasympathetic neurons. Detectable changes in the pulse are triggered by specific events within the body. There is considerable medical interest in the VAS, as evidenced by five International Symposia, the most recent one held in Lyon, France in 2016. Several United States Patents and both diagnostic and therapeutic tools are based on the phenomenon. The method is sometimes referred to as Peripheral Arterial Tonometry, or PAT. A response is an answer to a question, and the VAS is the body’s reaction or answer to a question posed by the introduction of stimulation into the body or into its energy field. ​The VAS is rapid and extremely sensitive, and it can be used to discover both the best treatment for a problem as well as more subtle levels of disturbance or imbalance. These include blockages to the healing response, layers of pathology, appropriate priority for treatments, and even subclinical issues. The VAS can be used both before and after a treatment to determine the accuracy of the diagnosis and the success of the treatment. VAS is a very sensitive way of “listening” to the body as well as a way to provide feedback to the patient. A wide variety of therapeutic schools around the world train practitioners to read the VAS and use it to define areas of the body under stress, the causes of the stress, chemical intolerances, and the degree of success of interventions. The VAS can also provide early warnings of subclinical issues and therefore provide the practitioner with the opportunity to reverse developing conditions at an early stage. The basis for biofeedback is that most physiological processes previously thought to be regulated automatically (autonomic nervous system) CAN be regulated consciously if the processes can be brought to awareness via appropriate measurements. Most physiological events in the body have electrical interactions. Biofeedback technologies involve measurements of electrical events as the feedback signal. As with PEMF, there is a huge database of peer-reviewed literature on the safety and clinical effectiveness of biofeedback for the treatment of a variety of conditions, some of which are difficult to resolve by other methods. Other ways of providing biofeedback include light, electrical stimulation, and even wave-forms viewed on an oscilloscope. Biofeedback has proven non-invasive, safe, and effective for a wide variety of conditions, and most biofeedback technologies have FDA approval. Biofeedback has the advantage that it is patient specific. In other words, the patient’s own body regulates the process and determines when the end-point has been reached. Combining PEMF and Biofeedback ONDAMED combines PEMF and biofeedback for both diagnosis and therapy. The VAS provides feedback on the responses of the body to specific frequencies, and the sounds emitted by the hand-held applicator and its anatomical location provide feedback during the treatment phase. Biofeedback continuously informs both patient and practitioner during the diagnostic and treatment procedures. ONDAMED® has been used successfully in Europe since 1993 and is part of the therapy you'll receive in you 10 day Cleanse. We have a growing list of ailments that the ONDAMED® has helped resolve. Patients who have tried the conventional treatments and run out of options are seeing excellent results! This is FASCINATING...I'd like to learn more! Please email more information. I prefer to talk with someone. Can you send me info...and then call me?